Tactical Reload: Trick or Reality? Competition is a good thing, but it isn't training. IDPA tricks such as the so-called "tactical reload" can get you killed, says our resident curmudgeon. Talk about your basic water-cooler conversation: I'm actually standing by a water cooler perched on the gate of a pickup, the only respite on a blistering-hot range for a Saturday match hosted by the local International Defensive Pistol Association (IDPA) club. A couple of new shooters are chugging the still-cool water, talking about the match and congratulating themselves for their decision to shoot IDPA rather than one of the other practical shooting sports. "At least I'll be ready if I ever have to defend myself with my gun," says one. "Absolutely," the other newbie says. "Thank heavens we didn't get involved with one of those sports that could get us killed." OK, I admit it. I giggled a little. At least I managed to keep from laughing out loud. Despite hype to the contrary, IDPA is no closer to "tactical reality" than bull's-eye shooting. That's because of a simple fact pointed out to me by the great Jim Cirillo, who, heaven knows, is one of the few people qualified to comment on shooting people professionally and who happened to shoot on my squad in the first big national invitational IDPA match. "Notice anything about the targets?" Jim asked me. "Plain old cardboard," I said. "That's right," said the old gunfighter. "Not a damn one of 'em is shooting back." This is the part of the article where I tell you my credentials as a "Tactical Demon of Darkness, Kill-'Em-All Operator Dude," except that I don't have any. That's right--I'm probably one of only 10 people in the firearms business who was never a SEAL, a member of a special-ops team, an "operator" of any sort, a commander of a SWAT team, a bodyguard for royalty or at the very least a highly decorated undercover officer in narcotics/gang/any other scary-sounding venue. Sorry. The gun comes slightly in and cants while the fully charged magazine is brought to the gun. In a speed reload, the partially spent magazine would already be on the ground. I am, however, something of an expert in the arcane field of high-stress decision-making, a distinction I earned in more than a decade of doing relatively--and sometimes extremely--dumb things for money. Cave diving, climbing big mountains, pitching kayaks off waterfalls, river surfing (trust me, skip this one), running serious whitewater, hang-gliding, parasailing, skydiving, downhill mountain-bike racing, ice climbing--you name it. If the fee was right, I was your boy. You become very focused on your training, and your training becomes very focused on what keeps you breathing. Yes, the "real vs. game" debate has been going on for a long time (I assume the Romans had something similar going on about sword-fighting), and it would be nothing more than angels dancing on the head of a pin except for one central problem. Recall our water-cooler conversation: "At least I'll be ready if I ever have to defend myself with a gun." Unlike Baskin-Robbins, in the world of high-stress decision-making, there are only a few flavors: I know how to do this; I don't know how to do this; I think I know how to do this but really don't; I don't think I know how to do this but really do. "Do know how" and "Don't know how" are pretty straightforward. So is the last option since in reality it's the same as "Don't know how." The problem comes when, as one of my early mountaineering instructors was fond of saying, "Your mind makes bets your body can't cover." You think you know what you need to do and how to do it, but when the proverbial balloon goes up, you're left wondering in those closing minutes of your life what just happened. Well, you've just discovered the difference between playing a game, albeit a very fun game, and training. Let me be more specific. Let's talk about IDPA's greatest shibboleth, the tactical reload. A close-up of Rauch's finger orientation, which is very similar to making a one-handed cat's cradle. The practical shooting sports started out practical and became less so, causing a split in the ranks. IDPA was born to guarantee a shooting sport that focused on carry guns as opposed to finely tuned "raceguns." So far, so good. IDPA was also a reaction to the direction the other practical sports had headed--complex, athletically oriented stages with round counts in the bazillions. IDPA's founders vowed to "keep it real." Now here's where things get sticky. IDPA's simplified, reality-based stages of fire were very good things as was its focus on truly concealable handguns carried concealed and forcing competitors to really utilize cover. However, IDPA also began filling up with all manner of flotsam and jetsam under the guise of "tactical reality." Enter the tactical reload. As explained in the IDPA Handbook, a tactical reload is simply topping off your blaster during a lull in the fight, retaining whatever unfired ammunition that remains in case you need it later. It's actually one of three reloads recognized by the organization, the other two being a reload from slide lock and "reload with retention," which IDPA defines as dropping the spent magazine into your hand and putting it in your pocket, then drawing the fully charged magazine and inserting it in the gun. The tactical reload is preferred, according to the rulebook, because it leaves the shooter with a one-shot gun for the shortest period of time. The partially spent magazine is ejected into the palm of the hand. It is held between the fingers and palm while Rauch is still holding the fully charged magazine with his thumb and index finger. "Method A. 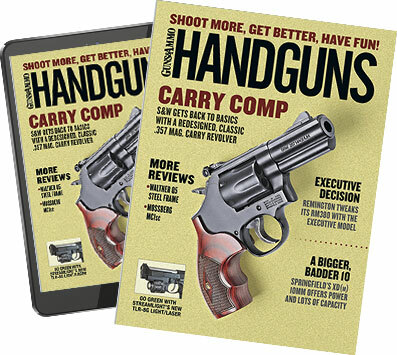 When I bring the fresh magazine to the gun, I eject the partially filled magazine into my off-hand and capture it with my palm and last two fingers (then stow it in a pocket to retain the remaining rounds). "Method B. Some schools teach that when you have the replacement magazine at the gun, you shift this magazine so that it is now protruding from between your middle and third fingers. Then you catch the partially empty magazine with your palm, forefinger and middle finger and insert the fresh magazine." Now that we know how it's supposed to work, let's take a look at the tactical reload through the eyes of our ever-present companion, the Inner Monkey. We are truly the children of the ancient killer apes, blessed with an "operating system" that has quite literally given us the world. Our operating system, that set of software routines and their associated actions intended to keep us alive, was designed for a very different world than the one we live in now. Our original predators had really big teeth and us on the dinner menu, and our primary stopping-power issues revolved around the best hardwood for bludgeons. Despite a change of milieu, our Inner Monkey--IM, for short--is still peeking around the corners of our mind, looking for sabre-tooths and dire wolves, and we have the appropriate set of hard-wired reactions for just such problems. For example, when threatened, we focus on the threat, our IM jumping up and down and pointing at the thing that wants to kills us. In this case, focus means much more than "pay close attention to." A whole series of mental and physical reactions crank up; all our senses narrow down, focusing on the threat. (You know about tunnel vision, auditory exclusion, the "slowing" of time effect, etc., right? If you carry a gun, you'd better.) We lose fine motor control as a whole pharmacy of drugs is launched into our bloodstream to better prepare us to either run like hell or attack. Ralph Mroz, author of Defensive Shooting for Real-Life Encounters and one of the most thoughtful commentators on the current state of self-defense training, calls this the "startle effect." We monkeys startle. Which leads us to the first rule of training for high-stress decision-making: You can't beat the operating system, the IM. Not ever. At its best, the tactical reload is a Rube Goldberg collection of fine motor movements. Don't believe me? In the course of your average day, how many things do you catch by grabbing with your palm and last two fingers? Or with your palm, forefinger and middle finger? The short answer is none. Tell yourself over and over again that you're going to catch a ball using only your palm and a couple of fingers, practice as much as you want, then have someone throw a Nerf ball at your face, really hard. Your IM overrides your conscious thought, and you catch the ball with your entire hand because that's what the hand is designed to do, and it's what we've been doing for the last million years or so. Rauch finishes the reload, almost. He's sliding the fully charged magazine into the magazine well. If this were a speed load, the whole maneuver would be long completed, and Uncle Walt would be back in the fight. The more any action runs counter to our design parameters, the more we have to think about that action in order to accomplish it. The common answer to this is practice more; heck, there are even people who juggle running chain saws, so anything is possible. Two points here from my experience: In training for dangerous, potentially lethal situations, one of the biggest challenges was to never train an action that went directly against our IM because that training would fail under stress. Instead, we learned to break down an activity into its component parts, break down those component parts even further to their fundamental actions, then train from the ground up. Fundamental actions can be defined as "things monkeys do." A quick, simple example: I did some dives on deep wrecks, outside the bounds of recreational scuba. Several of those wrecks were covered with old fishing nets, making them death traps for both sea life and visiting divers. So the prudent diver always carried a knife, which the prudent diver practiced getting to from constrained positions. And was that knife a big, honking thing strapped to my ankle like in James Bond movies? Nope, my knives were small, razor-sharp blades designed to cut webbing and zip-tied to my scuba harness just below shoulder level. A reflex, high-stress reaction--crossing my arms over my chest--puts both hands on the knives. Rauch has the magazine in the gun, but notice how he's inserting it. Will it seat properly? It probably will because this is Rauch's vintage Armand Swenson 1911. Most of us, however, would feel better, and have better luck, slamming the magazine in. The major reason that speed reloads have been taken to amazing levels--sub-one-second reloads!--by top competitors is that the speed reload is built on a "monkey" movement of bringing the hands together. Try it: Close your eyes, and attempt to applaud. Wow! If you're like most primates, you were able to do it the first time. The speed reload builds on that fundamental movement. OK, the tactical reload is a bio-mechanically unsound technique, utilizing a nonfundamental series of fine motor movements that are virtually guaranteed to fail under high-stress conditions. But the tactical reload has even more problems. For a start, as Walt Rauch notes in his excellent book, the tactical reload probably won't work if you have small hands or are using a double-stack magazine. 1) It is slow, sometimes achingly so. At the very time when you want your gun refilled as fast as possible, you're fumbling around trying to remember which fingers catch what. On Brian Enos' excellent Internet forum, good shooters have reported their baseline times on a tactical reload are in the two- to three-second region when "everything goes right." Yeah, that happens a lot! Compare that to a one-second speed reload, the basics of which can be taught in less than five minutes. 2) The tactical reload is now responsible for the bulk of firearms malfunctions at IDPA matches. Failure to properly seat the magazine can leave you with a gun that doesn't go bang and a magazine on the ground, something of a worst-case scenario in one of those pesky real-world situations. When we started seriously competing in IPSC matches in the early 1980s we learned very quickly to slam the magazine in place (those plastic magazine bases used to be called "slam pads" for exactly that reason). His gun reloaded, now all Rauch needs to do is spend another few critical seconds fumbling around to place the magazine with rounds back in his pocket. I observed this for myself at the match referenced in the beginning of this article after being given a heads-up by Tom Judd, the match director. Tom and I started Front Range IDPA simultaneously with the national organization cranking up; our IDPA membership numbers are among the first 10 issued. Tom, a veteran firearms and tactical instructor, was and is concerned about the increase in "failure to seat" malfunctions driven by tactical reloads. "Are we teaching a technique that leads to malfunctions at a time when the person can least afford them?" he asked. I saw numerous failures to seat, including magazines dropping onto the ground. I also saw even more shooters taking extra time to make sure the magazine was seated after a tactical reload, pushing the average reload time into the five- to 10-second arena. 3) Because the tactical reload is based on nonfundamental fine motor movements, it requires more mental attention to have any hope of accomplishing it in an expedited manner. That means during the course of the reload, the shooter's focus is off the threat. Setting aside the issue of whether this is even possible given that a million years of evolution and a screaming IM demand that our attention stay on what's trying to kill us, you've now turned your attention away from your attacker for at least a couple of seconds. We know from the Tueller Drill that a determined attacker can cover 21 feet--seven yards--in 1.5 seconds. We also know that the overwhelming majority of civilian gunfights happen inside seven yards. While you're behind cover playing with your gun, your assailant is moving, getting into a better position to whack you. In the five seconds it's likely to take you to reload, your assailant could relocate his or her whole family into the neighborhood and probably erect a tent. Five seconds is forever. I had occasion to spend some time with an Israeli security specialist, military sniper and top firearms instructor a few months back. He was conversant with the shooting sports, and although his name can't appear in this article, I think his comments are germane. Where is that pesky pocket? "We stopped teaching tactical reloads," he told me, "because the people who tried to do them kept getting killed." So what do you do if you're trapped in Condition Black and you have a chance to reload? Speed reload the gun! Drop the partially used magazine on the ground, ram the full magazine in hard, and continue with what you were doing as quickly as possible. If you're kneeling behind cover when you do the reload and there's time, by all means pick up--another fundamental monkey move--the partially charged magazine, and stuff it somewhere. And if you're worried about not having enough ammunition in a firefight--even though no civilian gunfight that I could find reference to has been decided on round count--do what my Israeli friend suggests: "Carry more magazines." And for IDPA, c'mon guys, it's past time for a little tactical reality check. Veteran handgun competitor and author Michael Bane is host of the television series Shooting Gallery on The Outdoor Channel. He's also the managing consultant for the National Shooting Sports Foundation's media education program.